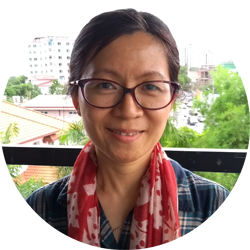 Nyein Su Su Thwe joined Community Partners International (CPI) in May 2018 to lead the organization’s Human Resources (HR) and Administration functions. Prior to joining CPI, she spent 10 years working in HR and Operations in the nonprofit and business sectors, including roles as an HR and Administration Director for Care International in Myanmar, as an Operations Manager for the Mennonite Economic Development Associates (MEDA) in Myanmar, and as a Senior HR Operations Manager for Capital Star Diamond Group. Nyein Su Su Thwe’s experience encompasses leadership and management across HR Business Partnering, Operations, Compensation and Benefits, Employee Relations, Safety and Security. She holds a Master Degree in English from Yangon University of Foreign Languages; and a Master Degree in Public Policy and Management form the Sol Price School of Public Policy, the University of Southern California, Los Angeles.